Barack and Michelle Obama flew from Washington D.C. to Palm Springs for a grand total of 3 days before jumping on a private jet and going back from where they came and then some ... so the question, was that the plan or was Palm Springs a washout? Fact is ... it was raining like hell all weekend. It was also super cold for SoCal. Obama got in one round of golf and that's about it, before they boarded Sir Richard Branson's private jet and took off for the Caribbean. On the surface it looks like the Obamas bailed because of crappy weather. But we found out their departure date was set even before the former prez left Washington D.C. We're told Palm Springs airport officials had conversations with the Secret Service about leaving on Monday, days before Branson's jet landed in the desert. 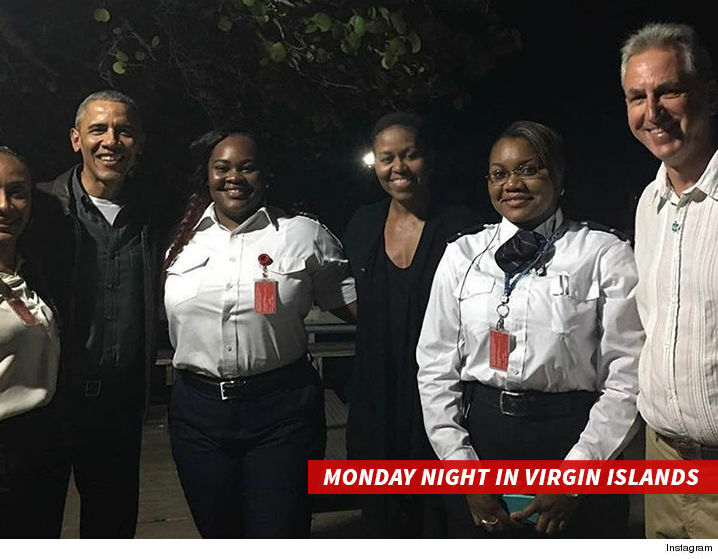 It's possible the Obamas made the decision to bail before leaving D.C. because they saw the weather report, but if that were the case why go to Palm Springs at all ... just beeline it for sunny Necker Island. And there's this ... Sasha and Malia, who were staying in D.C. when their parents left for Palm Springs, took Branson's jet Saturday from Maryland to Palm Springs. We're assuming the girls went to the Caribbean with their parents, but we haven't see pics ... so far. It could just be the former prez just wanted a round of golf with Larry Ellison and then blew out of town. It's what ballers do, right?